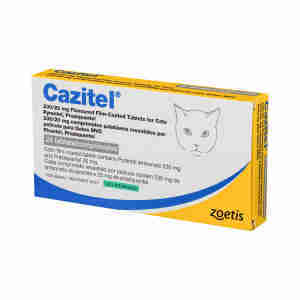 Cazitel Cat is a broad spectrum wormer tablet containing 230 mg pyrantel embonate and 20 mg praziquantel, that helps treat against roundworms and tapeworms. Ingredients: A white to off-white, grilled-meat flavoured, film-coated tablet containing 230 mg pyrantel embonate and 20 mg praziquantel. The recommended dose is 20 mg/kg bodyweight pyrantel (equivalent to 57.5 mg/kg pyrantel embonate) and 5 mg/kg praziquantel. This is equivalent to 1 tablet per 4 kg bodyweight. Tablets can be divided into equal halves to assist with accurate dosing. The tablets should be given directly to the cat but if necessary can be disguised in food. To ensure administration of a correct dose, bodyweight should be determined as accurately as possible.